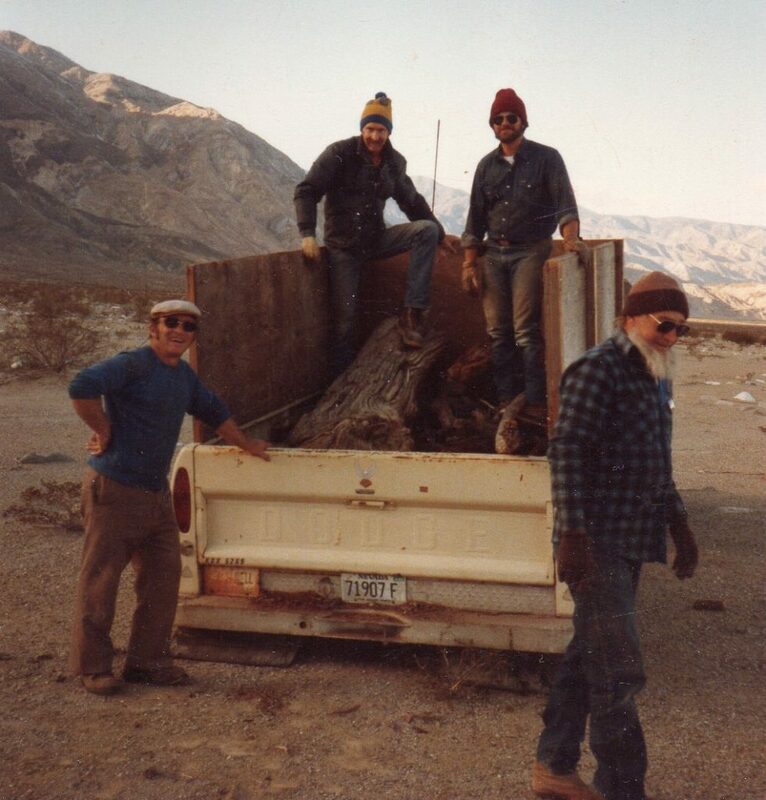 Back “in the day” an evening community campfire was a nightly social event at the Lower Warm Springs of Saline Valley. In the 1970’s there was a relatively small core community who often used the communal firepit to cook supper collectively. At the side of the fire ring was a customized truck tire rim. Two cross bars across the edge of the rim helped to support a barbeque grate. On the side of the rim a window had been cut out that would allow coals to be shoveled into the rim and under the grate. Over this window a square plate with the center cut out was welded as a shelf that would hold a pot or pan. People would gather to make their meal and through the course of the remainder of the evening we would all swap lies, tell jokes, solve the world’s problems and hopefully enjoy the music of entertainers such as Johnny Tequila and Guitar Frank. Eventually this might morph into lesser known and accomplished musicians for the late-night crew. The Lower Camp also hosted a rather large wood fired oven between the “bathtub” and the camp library. I cooked many a Cornish game hen in this oven. Legend has it that the oven was originally constructed to bake pizza. Dirty John was famous for his peanut-butter pizzas, there often being a lack of more traditional ingredients. These basic luxuries required a simple necessity: firewood. The process of acquiring the camp fuel was often a day’s event for the camp. We would find a likely truck or trailer (camp eventually came by a dedicated wood trailer) and head down the “Bat Rock Road” (a.k.a. the “Painted Rock Road) to the flats of Waucoba Wash, then hang a right and drive up into the wash. This was not against regulations in early days. Some distance up the wash (we had to go further as the years passed) we would come across lots of buried pinyon logs that had been washed out of the Inyo’s and buried in flash floods. Tell-tale signs of a buried log were often a slight feathering of old wood on the sandy surface of the wash. We would tap the exposed wood with a shovel. It might prove to be a rather meager piece of debris, or we might get lucky and hear a solid THUD indicating a buried treasure. I used to call these Y’all Logs (opposed to a Yule Log) meaning “y’all come help me move this big log!” These forays never failed to produce a goodly amount of wood for camp. Flutterbug Wade had built a solid maul for splitting (more like smashing) these logs, welding two axe heads side by side and welding them to a stout metal pipe. This tool proved to be indestructible and its disappearance from camp cannot have been a result of equipment failure. The wood was also so full of pitch that it could easily be lit by holding a match to any corner of a log. Many a night everyone around the campfire went home with blackface. It also burned rather hot. I cannot count the number of shoe soles I watched melt while folks put their feet up and leaned back to enjoy the night’s entertainment. 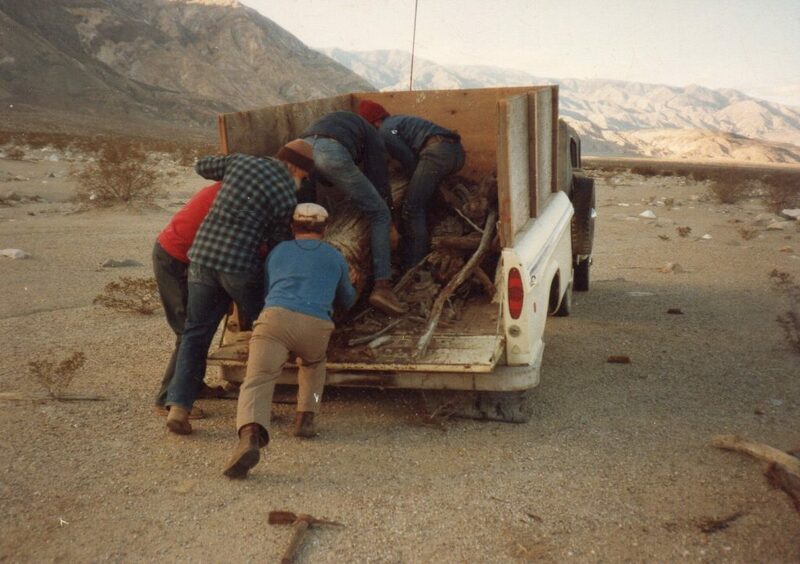 It took a team to load the Y’all Log. It took a while to dig this prize out of the sand, as well. Bathtub Bob with a holiday Y’all Log. Bob liked splitting firewood. There was yet another source of wood and often used for a different purpose. Every Thanksgiving Glen and Alan Akin would host a feast at the Morning Sun mill site across the valley below Beveridge Canyon and just south of the sand dunes. 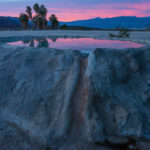 This event attracted friends of the Akins’ from outside the valley as well as the various residents of Saline Valley and those camped at the Springs. It was a mighty affair where one year I saw 14 turkeys cooked in a deep pit. The ladies would bake pies in Dan and Carol Dickman’s cook shack. A lot of wood was needed in preparation for the feast. Turtle Jim would generally organize this collection and lead the work party into the area of the Artesian Spring along the original road into the Warm Springs. We always made a point of collecting not only enough wood for the pit, but sufficient wood to see the Akin’s through the winter. 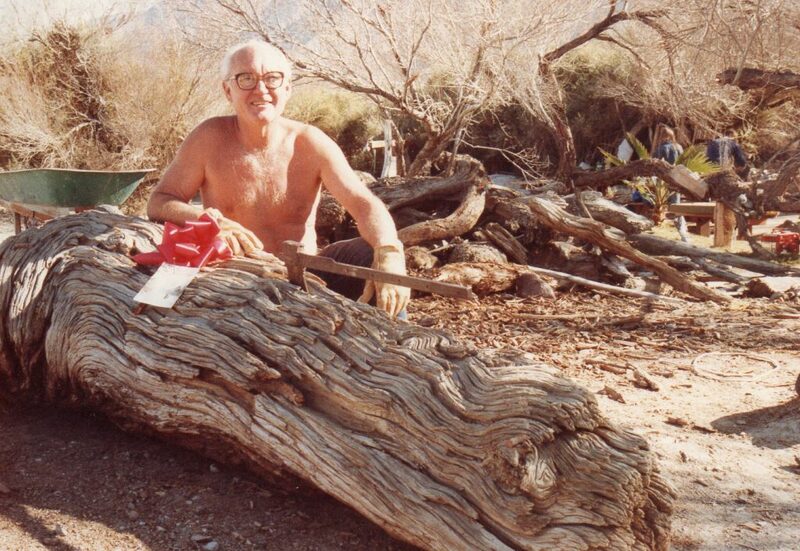 The wood collected was not buried pinyon, but old mesquite, and Turtle Jim always advised to bring a dull ax. His own dull ax was just an old axle shaft. All one had to do was to give a good wallop to the selected piece of branch and watch it splinter into loadable chunks. Recently flash floods issuing from McElvoy and Pat Keyes Canyons have brought pinyon and debris down to the valley floor and buried it in a manner quite similar to what we scouted in Waucoba Wash. It is a good illustration of how things looked in the way back when. Of course modern regulations prohibit the collection of this wood and the camp is better served by present visitors bringing their own firewood. Do not forget to haul some campfire ash back out with you when you leave. Your ashes might be too hot to put into your wagon, but you can easily take some from a neighboring camp. The camp and Park Service will appreciate your thoughtful service. As you read these humble efforts to transcribe some heritage and history, if you find you have some correction, clarification, or tidbit to add, I encourage you to add a comment at the end of this blog. Contributions will be welcome toward the final project, and all due credit will be given. 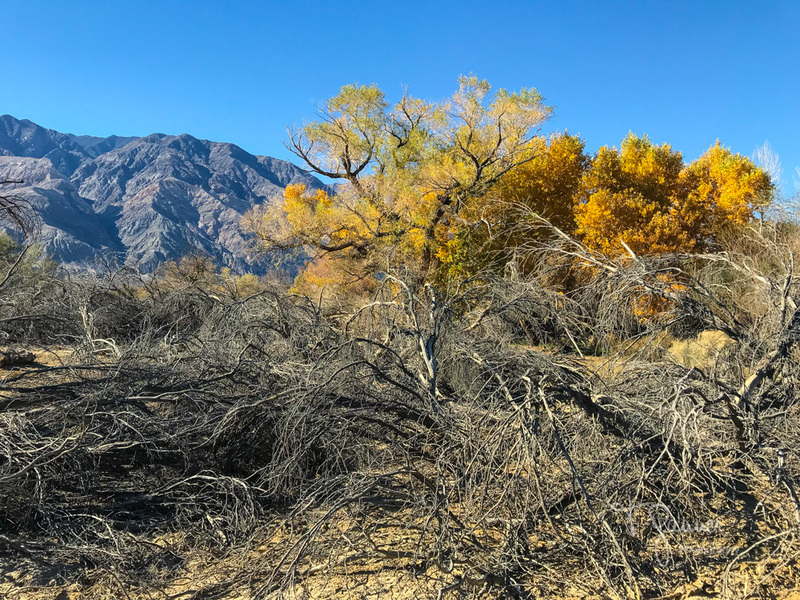 Please consider visiting the home page: Saline Valley Chronicles for a complete list of chapters published to date, and an overview of the project. As always, an enjoyable read. Thanks for doing this Tom. Bird Bob told a story about sitting around the fire at the lower springs. He was being ‘camp host’ while Lizzard Lee was out of the valley. Bob was thinking that some ‘newbe’ was kind of stupid, with their feet too close to the fire, and their soles melting. He thought that someone’s feet must be getting pretty hot. Suddenly, he realized it was his soles melting.